Whether in hospital or in the field, the new ZOLL AED Pro® is designed to perform in any environment. 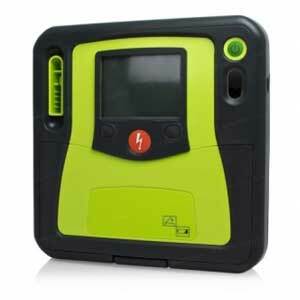 The AED Pro provides the ruggedness, portability, and advanced functionality that professional rescuers and services require from an AED. Designed with advanced capabilities, the ZOLL AED Pro supports Basic Life Support as well as Advanced Life Support professionals. A high-resolution LCD display allows responders to visualize a patient’s ECG while utilizing a 3-lead monitoring cable. Unique to ZOLL AEDs is a real-time feedback mechanism, known as Real CPR Help®, which allows rescuers to see and hear how well they are performing the rate and depth of chest compressions during CPR. Superior design and rubber over-molds are built to withstand harsh environments. Electrodes and batteries compatible with ZOLL M Series® professional defibrillators. Unrivaled battery compatibility and options (long-life disposable or rechargeable) that meet your specific needs. Real CPR Help® for rate and depth of chest compressions during CPR using ZOLL’s unique one-piece CPR-D•padz®. Easy unit configuration through ZOLL’s administration software.